Written Area: 4 pieces on same piece of brown paper (t-b, l-r): 191 x 31mm, 166 x 50mm, 98 x 170mm, 261 x 70mm; 1 separate fragment: 95 x 74mm. Number of Lines: 5, 28, 15, 43, 10. Line Height: approx 5mm. Line Rulings. Separate fragment appears to have some sort of elaborate signature/sign at the bottom. Used as a book covering. 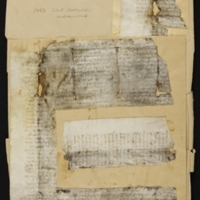 Physical Size: 5 parchment fragments from the same document, 3 approximately put back together. 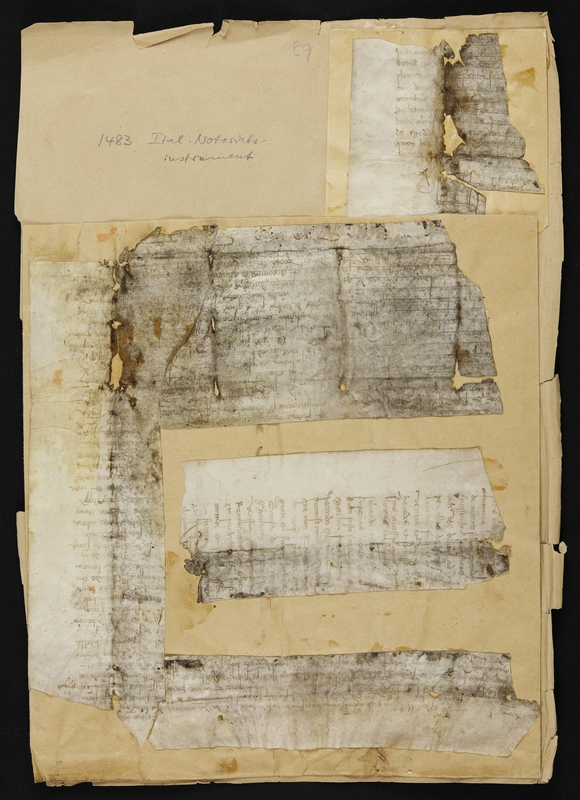 4 larger fragments (from top to bottom, left to right: 50 x 213mm; 166 x 72mm; 98 x 170mm; 261 x 95mm) glued to one piece of doubled over brown paper (282 x 258mm), 1 smaller fragment (95 x 98mm) glued to another piece of brown paper (100 x 110mm, and then all glued to one large sheet of brown paper (384 x 272mm).